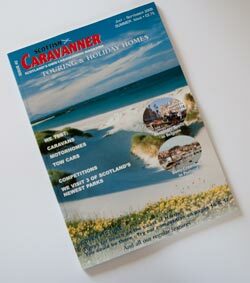 Caravan Clubs: Scottish Caravanner - find the right caravan club for you. There’s a very swish online version with animated turning pages and the ability to drill down to read full articles and get more information from advertisers. Very well done. The magazine is quarterly and is available on subscription for just £16.20 a year. Before you take out the subscription you can take a look at the online version to see if it is a publication that would suit you. The web site is more than just a companion to the magazine. It has an active news section, park finder and manufacturers directory.